Crossbreeding is a complex practice — a science in and of itself. Breeding one species with a specific other one, in an attempt to find a perfect balance between the traits of both, takes years, decades even, when several generations of animals are thrown into the process. Many of the animal breeds we're familiar with nowadays — dogs, cats, horses — are the results of centuries of breeding, generally with the goal of reaching a specific quality, like being easily domesticated, or physically powerful. But the breed in the video below was conceived for an entirely different purpose. 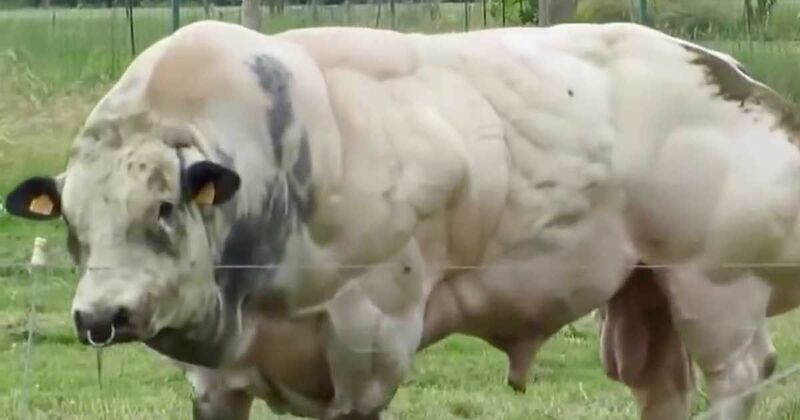 The Belgian Blue, as seen in the video below, is a cattle breed established in the early 20th century and is bred for a rather peculiar trait: muscular hypertrophy. Also referred to as double muscling, according to the Australian Journal of Agricultural Research, it is mostly seen as a benefit for cattle breeders rather than a disability, and is highly desirable for the quantity of meat it produces — and the price it nets. Belgian Blue cattle are popular in Europe and Australia, and have recently been introduced to the United States, the Oklahoma State Division of Agricultural Sciences and Natural Resources reports. The USDA has deemed the Belgian Blue's meat as rather excellent, and "on line for the new standards." Where do you stand on these breeding practices? Share your thoughts in the comments section.